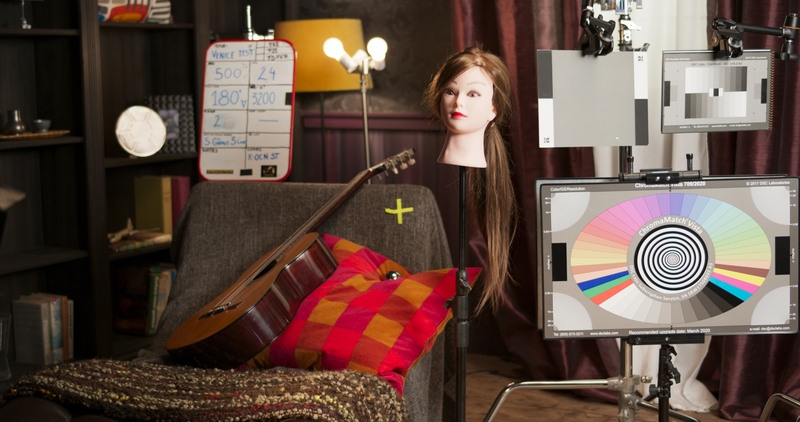 Sony Venice – A close look at the dynamic range and noise. With Sony Venice X-OCN files to download! I have been working with Sony’s colour science guru Pablo at the Digital Motion Picture Center at Pinewood, looking at the outer limits of what Sony’s Venice camera can do. A large part of the reason for this is that Pablo is developing some really nice LUT’s for use on dailies or even as a grade starting point (Pablo tells me the LUT’s are finished but he is waiting for approvals and feedback from Japan). As part of this process we have shot test footage with the Venice camera for ourselves and also looked long and hard at test shots done by other cinematographers. Last week we were able to preview a beta version of the cameras dual ISO modes. This beta firmware allowed us to shoot tests at both 500 ISO and 2500 ISO and the results of both are equally impressive. 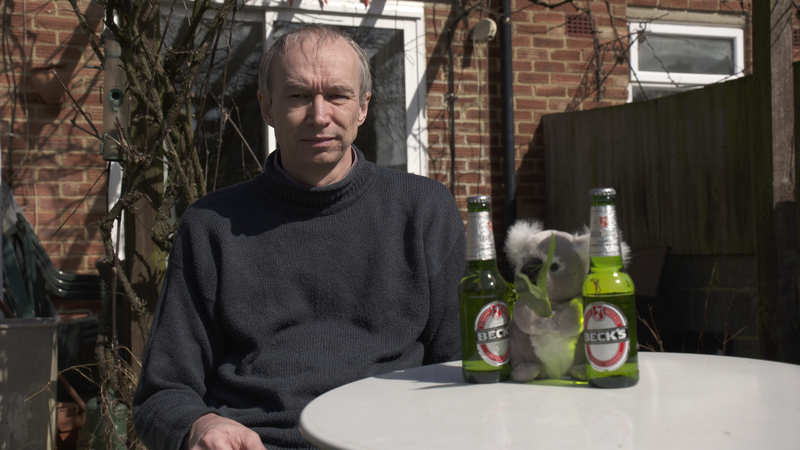 I can’t share any of the test footage shot at 2500 ISO at this stage. The firmware is still in it’s early stages and the final version may well perform a little differently (probably better). But I can share some of the footage shot at 500 ISO. Please remember what we were exploring was the extreme ends of the exposure range. 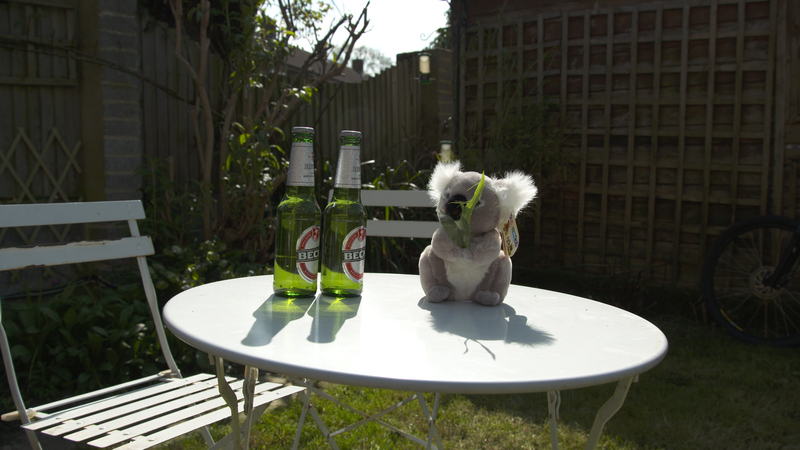 So our little test set was set up with some challenges for the camera rather than trying to make a pretty picture. We have deep, deep shadows on the right behind the couch and we also have strong highlights coming off the guitar, the film can on the shelves and from the practical lamp in the background. The reds of the cushion on the couch look very different with most Rec-709 cameras as the colors are outside the Rec-709 gamut. Another aspect of the test was to check the exposure rating. For this I used my Sekonic lightmeter to measure both the incident light and the light reflected by the Kodak grey card. My light meter gave me T4 at 1/48th for 500 ISO and this turned out to be pretty much spot on with what the scopes told us. So straight away we were able to establish that the 500 ISO exposure rating appears to be correct. We also found that when we stopped down by 2.3 stops we got the correct exposure at 2500 ISO, so that too appears to be correctly rated. Once the base exposure was established we shot at 2 stops over and 2 stops under, so from T2 down to T8 using a Sony 35mm PL prime. We used the XOCN-ST codec as we felt this will be the most widely used codec. When looking at the files do remember that the 16 bit XOCN-ST files are smaller than 10 bit ProResHQ. So these are files that are very easy to manage. There is the option to go up in quality to Sony’s linear raw codec or down to X-OCN LT. XOCN-ST sits in the middle and offers a nice balance between file size and image quality, it being very hard to find any visual difference between this and the larger raw files. The files I’m providing here are single X-OCN frames. They have not been adjusted in any way, they are just as shot (including being perhaps a touch out of focus). You can view them using the latest version of Sony’s raw viewer software or the latest version of DaVinci Resolve. For the best quality preview, at this time I recommend using Sony’s Raw Viewer to view the clips. If you find these files useful please consider buying me a coffee or beer. So what do the files look like? First I recommend you download and play with them for yourself. Anything I do has to have a LUT, grade or other process applied so that the linear data can be viewed on a normal computer screen. So it’s better to take a look at the original files and see what you can do with them rather than just accepting my word. The images here were create in DaVinci Resolve using ACES. ACES adds a film type highlight roll-off and uses film type levels, so the images look a touch dark as there were a lot of low light level areas in the test shots. Venice at T4 The base exposure for the test. Venice at T4 (From ACES). This was the “base” exposure for this test. Click on the image to enlarge. Venice at T8 – 2 Stops under exposed (As exposed). Venice at T8 (2 stops under). Click on the image to enlarge. Venice at T8 – 2 Stops under exposed (Brightness corrected to match base exposure). Venice at T8 (2 stops under). Brightness match to base exposure via metadata shift. Click on the image to enlarge. Venice at T5.6 – 1 stop under exposed (brightness corrected to match base exposure). Venice at T5.6 (1 stops under). Brightness match to base exposure via metadata shift. Click on the image to enlarge. Venice at T2.8 – 1 stop over exposed (brightness adjusted to match base exposure). Venice at T2.8 (1 stops over). Brightness match to base exposure via metadata shift. Click on the image to enlarge. Venice at T2.0 – 2 stops over exposed (brightness adjusted to match base exposure). Venice at T2 (2 stops over). Brightness match to base exposure via metadata shift. Click on the image to enlarge. Venice at T2.0 – 2 stops over exposed (as shot). Venice at T2.0, 2 stops over, as shot. Click on the image to enlarge. I shouldn’t rush these tests! I should have set the focus at T2, not at T4. Focus is on the chart, not the dummy head. It would have been better if the eyes and chart were at the same distance. It’s amazing how similar all the shots across this 5 stop range look. Just by adjusting the metadata ISO rating in Resolve I was able to get a near perfect match. There is more noise in the under exposed images and less in the over exposed images, that’s expected. But even the 2 under images are still pretty nice. What noise there is, is very fine in structure. Noise is pretty even across each of the R, G and B channels so there won’t be a big noise change if skewing the white balance towards blue as can happen with some other cameras where the blur channel is noisier than red or green. Even at T8 and 2 stops under the noise is not unacceptable. A touch of post production NR would clean this up nicely. So shooting at 500 ISO base and rating the camera at 2000 EI would be useable if needed, or perhaps to deliberately add some grain. However instead of shooting at 500 ISO / 2000 EI you might be better off using the upper 2500 base ISO instead for low light shoots because that will give a nice sensitivity increase with no change to the dynamic range and only a touch (and it really is just a touch) more noise. If shooting something super bright or with lot and lots of very important highlights I would not be concerned about rating the camera at 1000EI. For most projects I would probably rate the camera at 500EI. If the scene is generally dark I may choose 400EI just to be a touch cleaner. 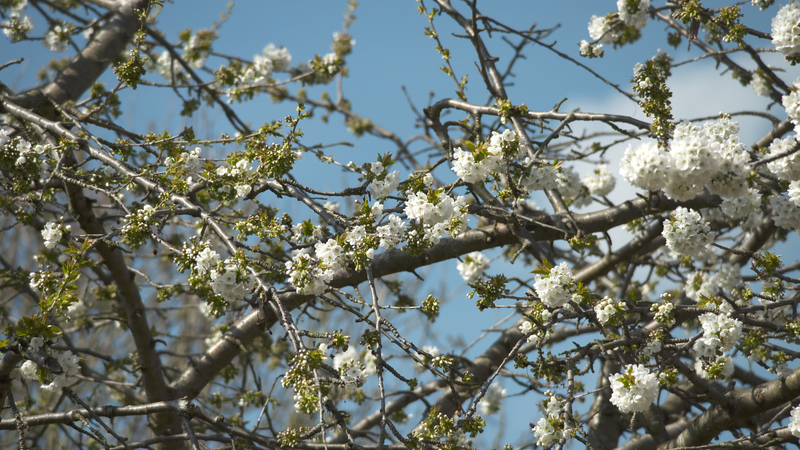 With such a clean image and so much dynamic range you really can pick and choose how you wish to rate the camera. Venice has more dynamic range than an F55 and maybe a bit more than the F65. Most of the extra dynamic range is in the shadows. There is an amazing amount of picture information that can be pulled out of the darker parts of the images. The very low noise floor is a big help here. In the example below I have taken the base exposure sample and brought the metadata ISO up to 2000 ISO. 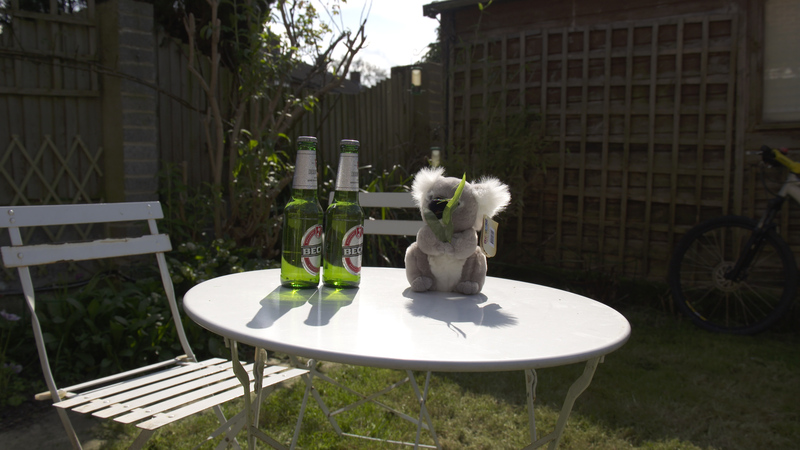 Then I have used a luma curve to pull up the shadows still further. If you look at the shelves on the left, even in the deep shadow areas it’s possible to see the grain effect on the dark wood panels. In addition you can see both the white and black text on the back of the grey book on the bottom shelf. Yes, there is some noise but my meter put these areas at -6 stops, so being able to pull out so much detail from these areas is really impressive. An amazing amount of information still exists in even the darkest shadow areas. This image adjusted up significantly from base exposure (at least +4 stops). In the highlights the way the camera reaches it’s upper limit is very pleasing, it does seem to have a tiny roll off just before it clips and this looks really nice. If you look at the light bulbs in this test, at the base exposure, if you bring the highlights down in post you can see that not all of the bulb is completely over exposed they are only over exposed where the element is. Also the highlights reflecting off the guitar and film can on the shelf look very “real” and don’t have that hard clipped look that specular highlights on other cameras can sometimes have. Another thing that is very nice is the colour tracking. As you go up and down in exposure there are no obvious colour shifts. It’s one of the things that really helps make it so easy to make all 5 exposures look the same. The start up time of the Venice camera is very impressive at around 6 to 8 seconds. It’s up and running very quickly. The one stop steps in the ND filter system are fantastic. The camera is very simple to use and the menu seems logically laid out. It’s surprisingly small, it’s not much bigger than a PMW-F55, just a little taller and a little longer. Battery consumption is lower than most of the competition, the camera appears to consume around 50w which is half the power consumption of a lot of the competition. It can be run of either 12v or 24v. So all in all it can be rigged as a very compact camera with a standard V-Lock battery on the back. Looking forward to shooting more with Venice in the very near future. 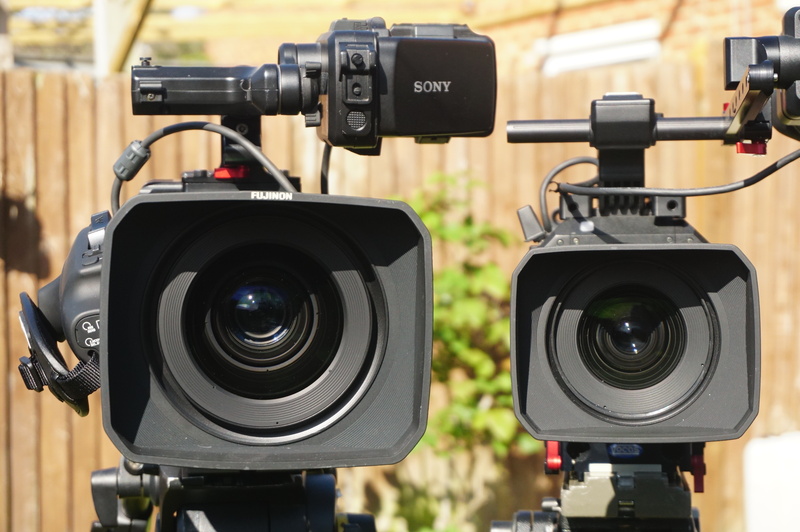 How does the Panasonic EVA1 stack up against the Sony FS7 and FS5? This is a question a lot of people are asking. As I’ve mentioned in other recent posts, sensors have reached a point where it’s very difficult to bring out a camera where the image quality will be significantly different from any other on the market for any given price point. Most differences will be in things like codec choices or trading off a bit of extra resolution for sensitivity etc. Other differences will be in the ergonomics, lens mounts and battery systems. So it’s interesting to see what Keith Mullin over at Z-Systems thought of the EVA1. Keith knows his stuff and Z-Systems are not tied to any one particular brand. Overall as expected there isn’t a huge difference in image quality between any of the 3 cameras. The EVA1 seems weaker in low light which is something I would have predicted given the higher pixel count. 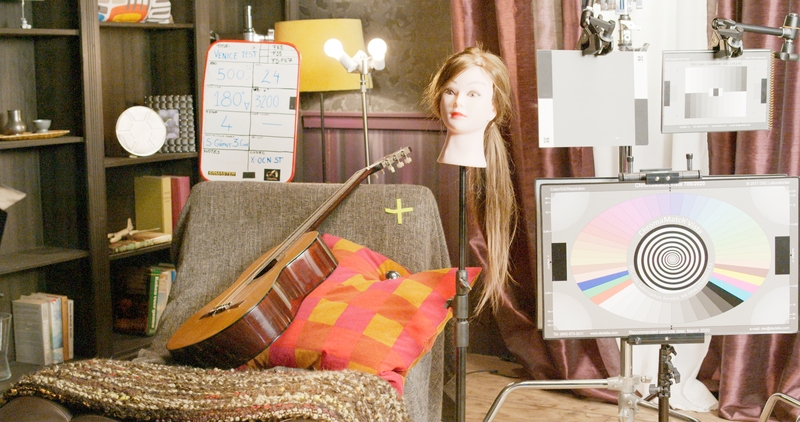 The dual ISO mode seems not to be anywhere near the same as the really very good dual ISO mode in the Varicam LT. The Fujinon Cabrio XK6x120 alongside the MK 18-55. Having done a fair bit of shooting with the new and very nice Fujinon MK 18-55mm E-Mount lens I decided to take a much closer look at the Fujinon Cabrio XK6x20 20 to 120mm T3.5 lens with the servo hand grip. The Fujinon XK6X20 20 to 120mm lens on my PMW-F5. The lens was loaned to me by Fujinon at my request as I wanted to test it for myself. The price of this lens is very competitive and it can now be found as low as £11K/$16K. Lets not try to pretend that good quality PL mount zooms are cheap, but this is a great price for what is very high quality glass. The 20 to 120mm zoom range is nice and of course it’s truly parfocal there is a back focus adjuster along with macro function. The XK6X20 viewed from the top. Like the other similar ENG style PL zooms this lens is quite heavy. The front element of the lens is huge and I’m sure a lot of the weight comes from this big lump of glass. One of the nice things about this lenses baby brother the MK 18-55, is that the 18-55 is really very light, which is great on the smaller cameras like the FS5 or FS7. The XK6X20 and it huge front element on the left and the smaller and lighter MK18-55 on the right. The 20-120mm Cabrio exudes quality. The build quality of the lens is wonderful, the witness marks are crisp and well engraved, the servo zoom is silky smooth. The large servo module acts as a handgrip just like traditional ENG lenses and it really comfortable to hold and use this way. But if you don’t need it it can be easily removed leaving the bare bones lens body and saving a little bit of weight. There are the usual 0.8 mod pitch gears on each of the focus zoom and iris rings. Focus ring travel is huge at about 200 degrees and due to the physical size of the lens this is as much as I’d ever want. Even towards infinity there is still a nice range of travel so focussing accurately on distant objects is easy. But what about the image quality, how does the lens perform in real world situations? To find out I used it for a shoot in Norway. The shoot was for TV manufacturer Philips. We wanted to obtain some high quality 4K HDR footage to show off the capabilities of a new 4K OLED Ambilight TV. Unfortunately the weather conditions on the shoot were pretty grim most of the time and this made it all the more challenging. But I’m pleased to say that both lenses performed very well despite snow, ice and cold. You can see the size difference here – XK6X20 on the left and MK18-55 on the right. One of the great things about having both the high end Cabrio 20-120mm and the budget friendly 18-55mm for the shoot was that the overall look of the images from the FS5 and F5 was the same. Often mixing lenses from different manufacturers results in different looking images giving the colourist more work to do in post. 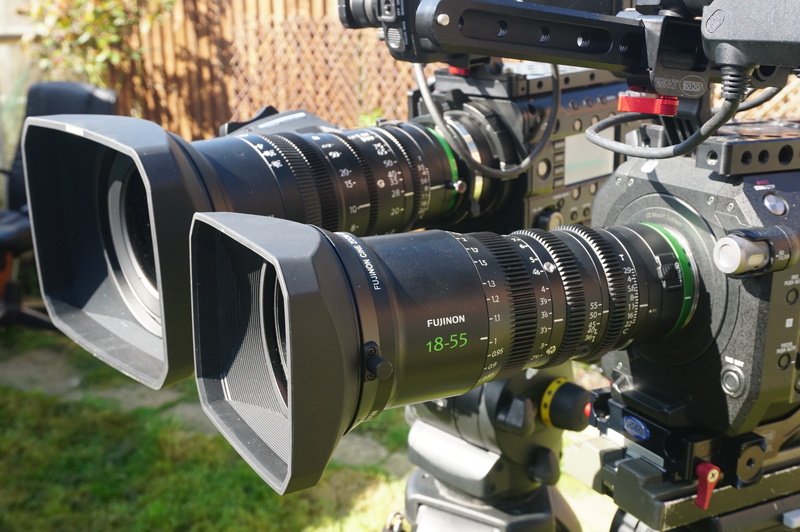 Fujinon now have a range of lenses to suit most budgets from the high end Cabrio 19-90mm T2.9 down through the Cabrio 20-120 T3.5 to the MK 18-55 T2.9. So what do the images from these lenses look like? I’m afraid I can’t show any of the footage from the Philips shoot yet, I should be able to show it later in the year. Below are a couple of frame grabs to give you an idea of the kind of images you can get. We didn’t shoot the same shots with the F5/XK6x20 and FS5/MK18-55 at the same time, I was the only cinematographer. So I don’t have a side by side comparison from the shoot, but the different scenes shot with each lens/camera combo match really well. 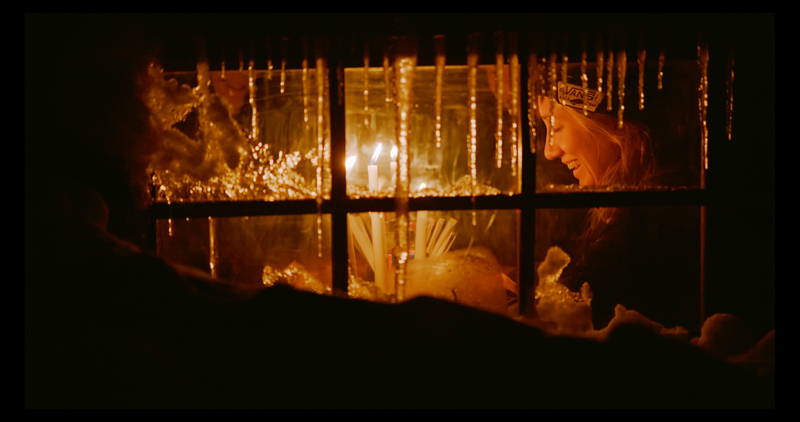 Sami woman feeding reindeer shot with the XK6X20 in Norway. Click on the image for a hi res version. Wide of Sami woman feeding reindeer shot with the XK6X20 in Norway. Click on the image for a hi res version. 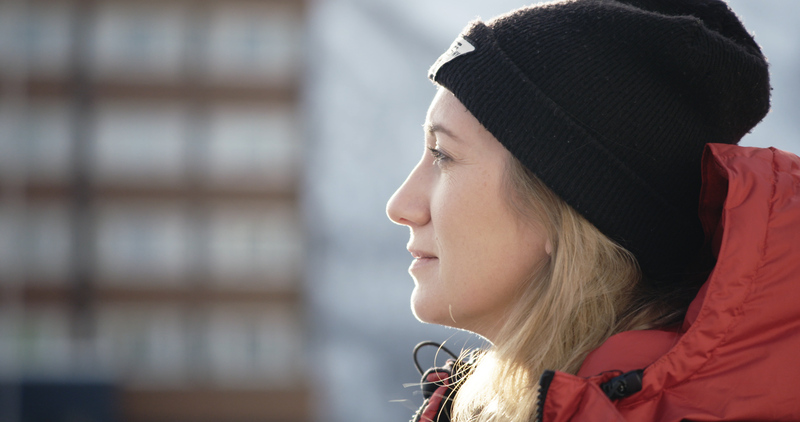 Annika Summerson filmed in Tromso with the Fujinon XK6X20. 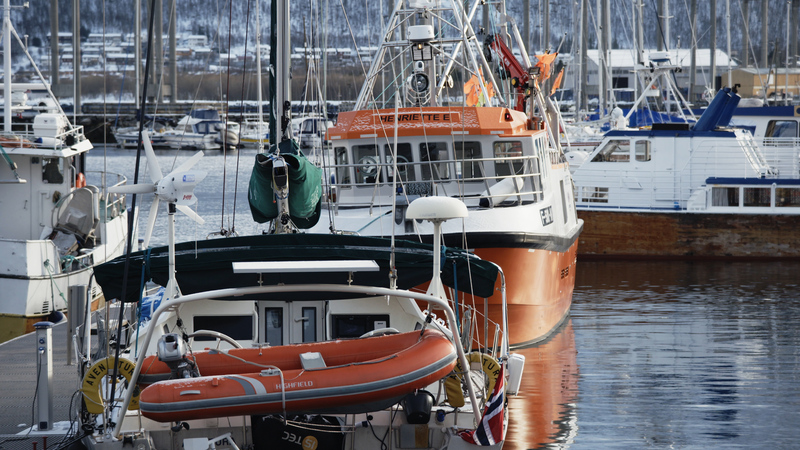 Boats in the harbour on a cold but bright morning (the only one we had). Icicles on the window. Shot with the Fujinon XK6X20 with my PMW-F5. 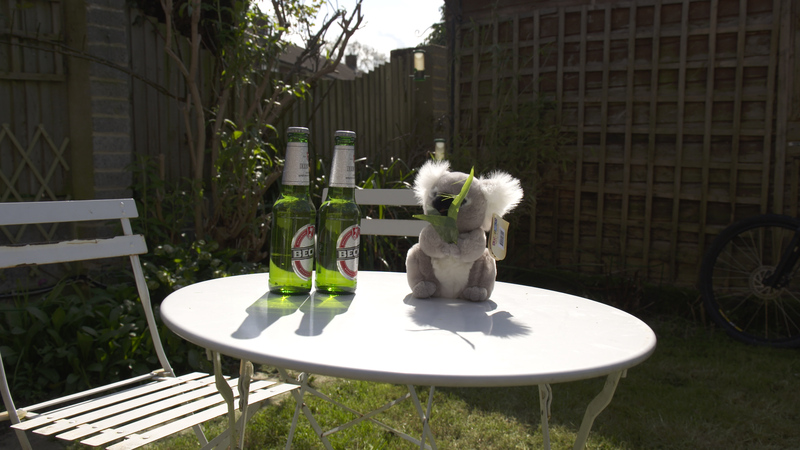 In order to better directly compare the two lenses I shot some test shots. The XK6x20 on my F5 and the MK18-55 on my FS7. Both cameras were set to the same settings and hypergamma 3 with the cinema matrix used. The images you will see below have not been touched, this is how they looked straight from the camera. If you click on the picture you should get a link to the full frame 4K image, but do remember this are Jpegs. Testing the Fujinon MK18-55 and XK6X20 with my PMW-F5 and PXW-FS7. I tried to get the same shots with both combinations but you will see some small variations. I apologise for that. To give as fair a comparison as possible I did most of the shots at 20mm and 55mm, but then in addition shot at 18mm on the MK18-55 and 120mm on the XK6X20 so you can see the additional range each lens offers. 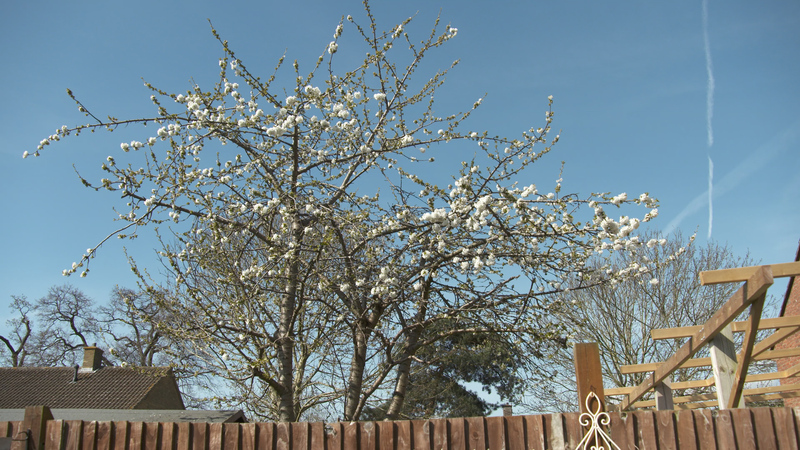 First test was of a neighbours Cherry tree in blossom. The FS7 with XF 18-55mm at 55mm. Click on the image for the full size 4K frame. PMW-F5 with XK20X6 at approx 55mm (sorry about the different framing). Click on the image for the size 4K full frame. 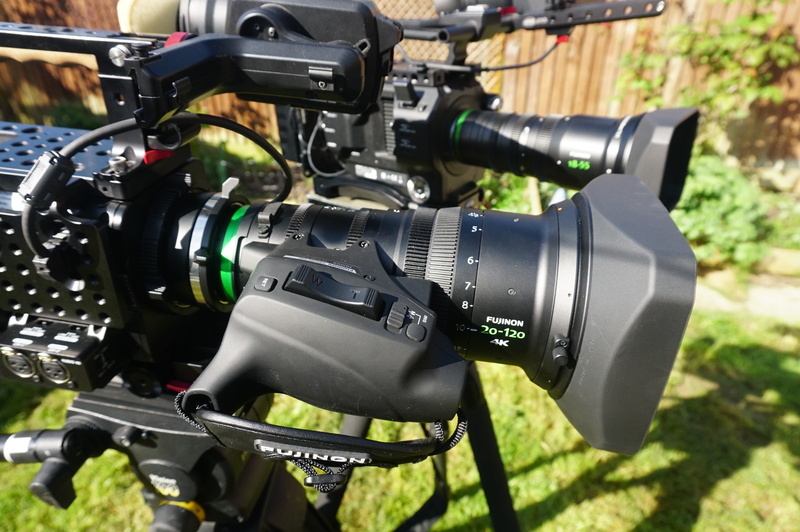 The FS7 with XF 18-55mm at approx 20mm. Click on the image for the full size 4K frame. PMW-F5 with XK20X6 at 20mm. Click on the image for the size 4K full frame. 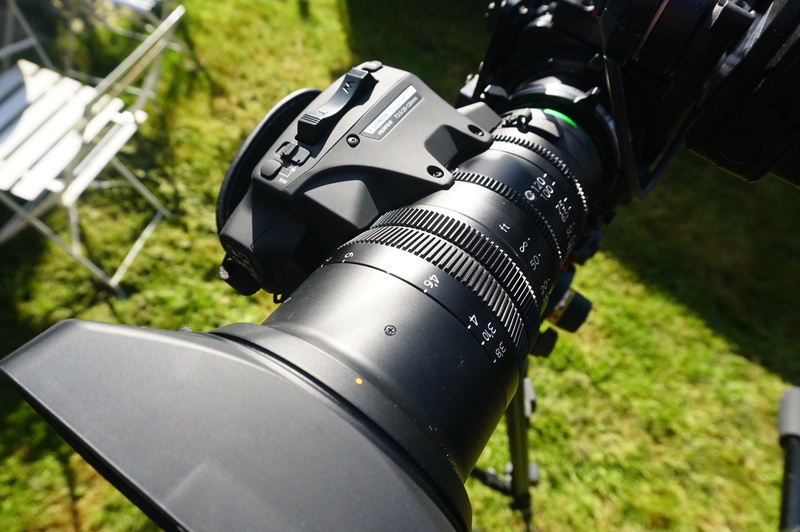 PMW-F5 with the Cabrio XK6X20 at 120mm showing the extra reach of the 20-120mm zoom. 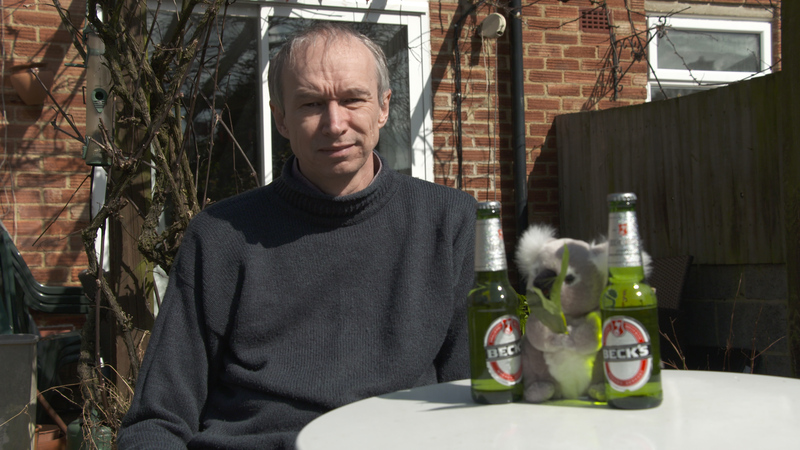 The next test was a simple setup shot of a couple of beer bottles on a table with strong sunlight from above and behind to create deep contrast. I wanted to see if either lens showed signs of loosing shadow detail due to the very large, very bright table top introducing flare into the shadows. 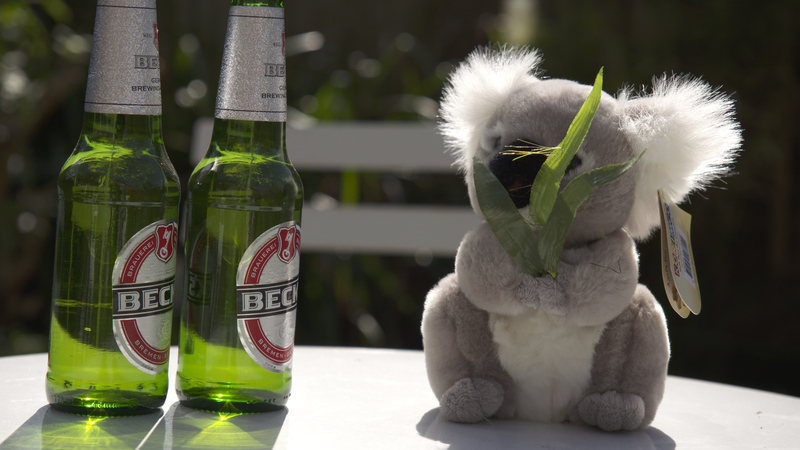 PXW-FS7 with XF18-55mm at approx 20mm, high contrast scene. PMW-F5 with XK20X6 at 20mm. High Contrast scene. Click on the image for the size 4K full frame. 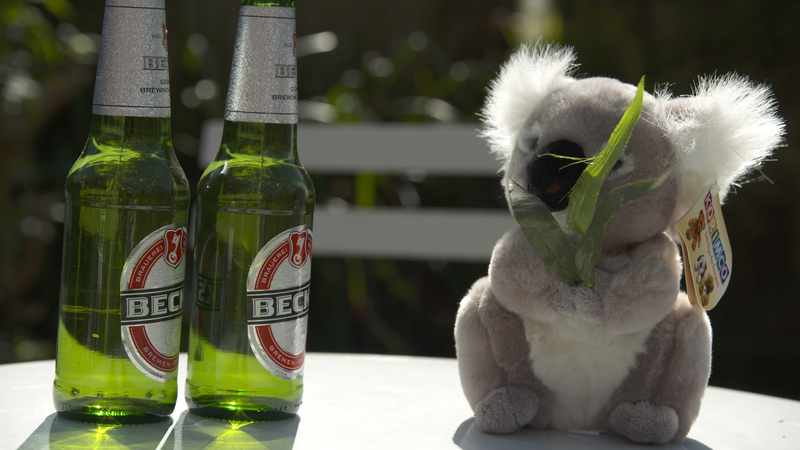 PXW-FS7 with XF18-55mm at 55mm, high contrast scene. PMW-F5 with XK20X6 at approx 55mm. High contrast scene. Click on the image for the size 4K full frame. 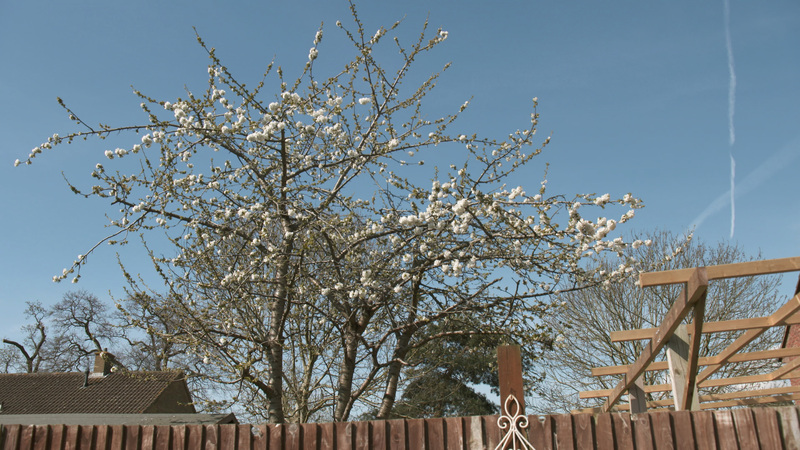 The FS7 with the XF18-55 at 18mm showing the extra “width” that 18mm gives over 20mm. My conclusion with the above shots is that there is remarkably little difference between these two lenses. Both perform extremely well. I think the XK6X20 might be marginally sharper at the wide end than the 18-55mm, either that or the slightly better viewfinder of the F5 is allowing me to focus more precisely. In addition I think the bokeh of the more expensive Cabrio is marginally smoother than the 18-55, but again it’s a tiny difference (not as big as the difference in white balance of the two cameras). Finally a shot of my ugly mug just so you can take a look at some skin tones. 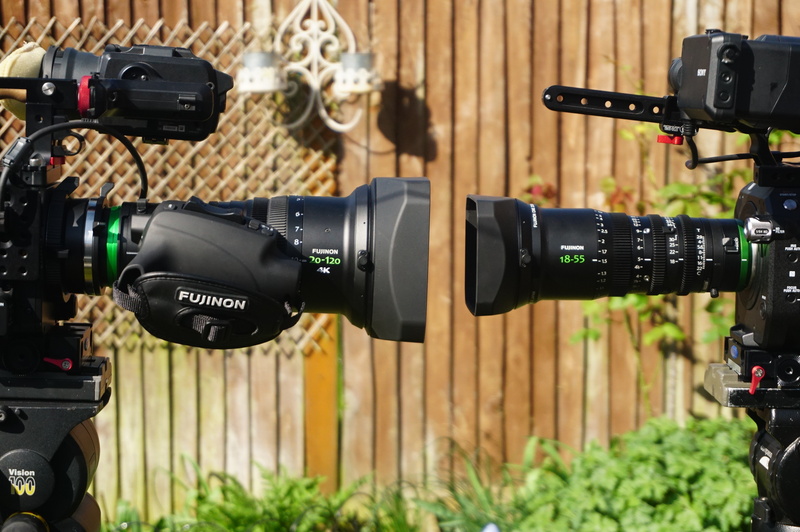 PXW-FS7 with Fujinon XF 18-55 at approx 30mm. Click on the image for full size 4K frame. PMW-F5 with Fujinon Cabrio XK6X20 at approx 30mm. Click on the image for the full size frame. Again very little difference between these lenses which is a good thing. Both perform very well, both produce pleasing images. Sure the XK6X20 20-120mm is more than twice the price of the MK18-55 but then it does offer twice the zoom range and it’s very hard to make fast parfocal lenses with big zoom ranges for large sensors. There will be a companion MK50-135mm lens coming later in the year, so with both the MK lenses you will be able to get the full range of the XK6X20 and a bit more, provided you don’t mind swapping lenses. It’s a tough choice if you have an E-mount Sony camera, which to get? For E-Mount I think the pair of MK lenses will be the way to go. If you have a PL mount camera the XK6X20 has to be a very serious contender. It’s a great all-round cinema zoom lens and a realistic price. Whichever way you do go you won’t be disappointed, these are proper cinema lenses. 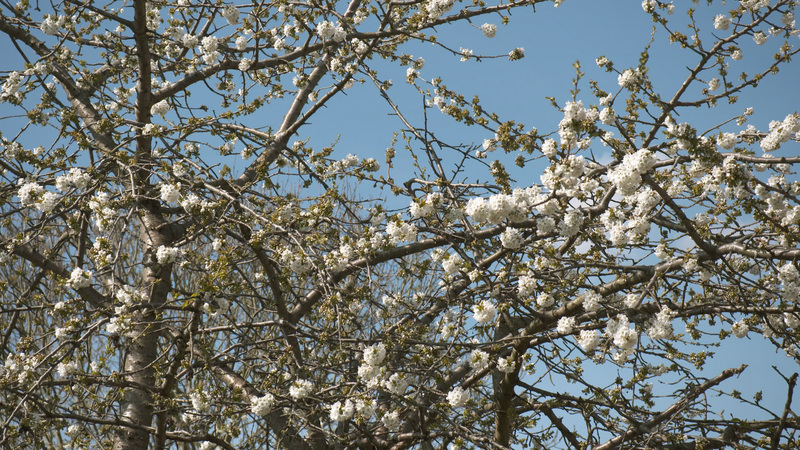 Sample Footage from PXW-X180 XAVC/XDCAM/AVCHD camcorder. I was lucky enough to get to spend some time with a pre-production Sony PXW-X180 here in Singapore. I put it through it’s paces shooting around the botanical gardens, China town and Clarke Quay. For a 1/3″ camcorder it produces a remarkably good image. Really low noise, very clean images, much better than anything I have seen from any other 1/3″ camcorder. The 25x zoom is impressive, the variable ND filter is very clever and it might seem trivial but the rear viewfinder was very nice. It’s a very high resolution OLED, much, much better than the LCOS EVF’s found on many other models. The zoom lens has proper manual calibrated controls with end stops, much like a PMW-200. The ability to use a multitude of codecs is fantastic and perhaps better still is the fact that you can use SDXC cards for XDACM or XAVC at up to 50Mb/s, so even XDCAM HD422 can be recorded on this low cost media. This will be great for news or other situations where you need to hand off your media at the end of the shoot. A more in depth review will follow soon, but for now here’s the video. Un-graded, un touched, straight from the camera footage. Looks very nice if you ask me. NEX-FS700 Slow Motion test clip. I was lucky enough to be able to borrow a pre production Sony NEX-FS700 for an evening and of course the one thing I had to check out was the super slow motion function. So my good friend Den Lennie let me shoot from his balcony overlooking the Belagio fountains in Las Vegas. The video speaks for itself really. The slow motion function is incredibly easy to use and I was surprise how well it performed shooting at night at 240 frames per second (1/240th shutter). There are lots of other nice features on the FS700 which I’ll write more about in a later post. Vinten Vision 100 Long Term Review. I’m a long time Vinten user. My first true, pro tripod was a Vinten 5 with alloy legs that I purchased in 1989 (I think). 22 years on I still have that tripod and it is still perfectly useable. Since then I’ve been the very happy owner of a fabulous set of Vinten FibreTec legs (still have them, still love them) and a new model Vinten Vision 5AS. All of these have been excellent, reliable and virtually indestructible. I’ve taken them up into the Arctic where it’s been -36c. I’ve taken them to the Arizona desert, into Hurricanes, Sand Storms and all kinds of extreme weather. I’ve even used them stood waist deep in the sea (not really recommended). Anyway, I’m waffling… When I needed a bigger tripod to support my Hurricane 3D rig I obtained a Vinten Vision 100. The Vision 100 is not a new model, but it has a reputation for being able to take a quite remarkable payload for it’s size. You see the Vision 100 head is not much bigger or heavier than my Vinten 5, yet it can take double the payload (20kg). This means that I can still pack it in to my luggage when I’m travelling without getting crippled by high excess baggage charges. One of the features that has made it particularly useful for 3D is the digital counterbalance readout that tells you exactly where you are within the heads very generous and continuously adjustable counter balance range. When swapping between the 3D rig and a conventional camera I can simply dial in the numbers that I know give me optimum balance and off I go. One minute I can have a 3D rig with a pair of F3 etc, weighing over 15kg, then after a few turns of the counterbalance knob I can mount just a single F3 weighing only 3kg and the tripod works beautifully well with either payload. The continuously adjustable drag adjustments for pan and tilt are easy to set and if you want you can get a lot of drag. I find this very useful when shooting air shows with long lenses as I like to have quite a bit of drag to work against to keep things smooth. The smoothness of this head is lovely with no sudden slips or tight spots, it’s a pleasure to use. The legs I have been using with the Vision 100 head are the Vinten 3 stage carbon fibre Pozi-Loc legs. Even though these are nice and light, they are remarkably stiff. I also have one of Vinten’s clever Spread Loc mid level spreaders. I first got one of these with my FibreTec legs and I’ve never looked back. You can lock the spreader at almost any spread position with a quick turn of the single locking knob. If you need to get the legs down low there is a little button on each arm of the spreader that allows the arm to extend to up to twice it’s original length. The end result is the ability to get very low, even when using standard legs. Tripods are pretty boring things really. Not as glamourous as a camera, but an essential piece of kit anyway. Get the right tripod and it will last you many, many years, almost certainly out lasting those glamourous cameras. All the Vintens I have owned have been superb. The Vinten 100 is a solid, well made piece of kit that I don’t even really think about when I’m using it. And that is after all what you want, gear that just gets on with its job. In preparation for the big Duran Duran shoot in Berlin later in the week I was out with Den Lennie of F-Stop academy along with Duran Duran video producer Gavin Elder and James Tonkin of Hangman Studios testing the Canon 800/1600 f5.6 lens on my F3. This is an adapted DSLR lens fitted with a PL mount. What a lens! The bokeh was simply gorgeous from this lens and I’m really excited about putting it to use in Berlin on Thursday night. Keep tuned for more info on this BIG project shooting with F3’s, FS100’s and SRW9000PL’s. We’re even throwing in a VG10 or 2 for good measure! Nine cameras in total, ultra shallow DoF is the goal, gonna be hard to do, but it should look awesome. 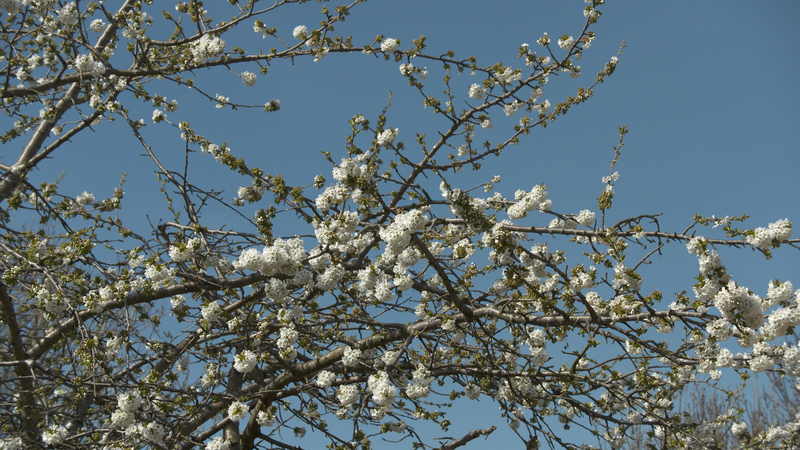 Here is a set of 3 clips in the native formats taken with a Sony VG10, Canon t2i (550D) and sony F3. CLICK HERE for the zip file containing the native fies (canon .mov, sony .mts and Sony BPAV folder) or click here to watch on vimeo. If you are going to watch on vimeo I would strongly urge you to take a look at the full size frame grabs below before coming to any conclusions. I used the same Nikon 50mm f1.8 lens on all 3 cameras (MTF F3 adapter, cheap E-Mount adapter and cheap Nikon to Canon adapter). I had the lens at f8-f11 for all three cameras and used the shutter to control exposure or in the case of the F3 the ND filters. All were set to preset white, 5600k, the sky was visually white with flat hazy cloud. The VG10 was at factory default, the t2i was default except for Highlight Tone Priority which was ON and the F3 default with the exception of Cinegamma 1 being chosen. PLEASE PLEASE PLEASE Don’t link directly to the download file, instead link to this page. Feel free to host the clips, just remember they are my copyright so include a link back here or a note in any text of where they originated. PLEASE make a donation of whatever amount you feel appropriate if you find these clips helpful, to help cover my hosting fees if you choose to take advantage of these otherwise free clips. It’s a 340Mb download. As of May 9th, 122 people have downloaded the clips, that’s 41Gb of web bandwidth, yet not one person has made a donation. Come on guys and gals, if you want me to make clips available to download, help me out. Below are some frame grabs from the 3 cameras. If you click on the pictures a couple of times they will open full size in a new window. All 3 cameras do a pretty decent job overall. However both the VG10 and t2i have issue with aliasing on the brickwork of the far building. I know the idea with these cameras is to use a shallow DoF so often the background will be soft, but not everything will be like that all the time. There are also more compression artefacts from both the t2i and in particular VG10 (the barbed wire at the beginning of the pan looks pretty nasty). At least with the VG10 you can take the HDMI output and record that externally. Clearly the best pictures are from the F3, but then it is considerably more expensive than the others. It is interesting to note the distinctly yellow colorimetry of the F3. I do have matrix settings to reduce this, but I did not use them during this assessment. Also note how much wider the FoV is with both the Canon t2i and even more so the F3. Clearly these cameras have larger sensors than the VG10, the largest being the F3’s Super35 sized sensor. This was another surprise, I had assumed the Canon and F3 sensors to be much closer in size than this. Remember that all three used the same lens and the shots were done from exactly the same place. PMW-F3 and EX1R aliasing comparison. Here is a roughly done (sorry) comparison of the aliasing from an EX1R at the bottom and my F3 at the top. The F3 had a Nikon 18-135mm zoom, both cameras were set to default settings, 25P. The F3 clearly shows a lot more chroma aliasing appearing as coloured moire rings in both the horizontal, vertical and diagonal axis. The EX1R is not alias free. The chroma aliasing from the F3 is not entirely unexpected as it has a bayer sensor and there is always a trade off between luma resolution and chroma resolution and the point where you set the optical low pass filter. Frankly I find this performance a little disappointing. More real world test are needed to see how much of a problem this is (or is not). To put it in to some perspective the F35 aliases pretty badly too, but that camera is well known for producing beautiful images. I hope I’m being over critical of this particular aspect of the F3’s performance, because in every other respect I think the camera is fantastic. UPDATE: I’ve taken a look at the MTF curves for the F3 and they are quite revealing showing that an OLPF is in use which is giving an MTF50 of around 800 LW/PH V and 950 LW/PH H. This is not quite as high as an EX1 and are quite reasonable figures for a 1920×1080 camcorder. This suggests that the aliasing is largely limited to the chroma sampling of the sensor. As this is a bayer (or similar) type sensor the chroma is sampled at a reduced rate compare to luma, which is why coloured moire is not entirely unusual.